Star Trek has been parodied by everyone from Saturday Night Live to Family Guy, but no one has done it better than the web serial Voyage Trekkers. Most Trek parodies involve making fun of red shirts or having Shatner say something lame. That or they drone on and on about how stupid the show was. To me Galaxy Quest is the best Star Trek parody because it was done with love. Voyage Trekkers is like that. The serial takes it further because it makes fun of all goofy sci-fi team shows like Flash Gordon and Buck Rogers. Even though the show is set in space, the humor comes from normal everyday stuff. Playing practical jokes. Racial humor ("Is it wrong that I can't tell one from another?"). Blogging ("No comments? Hunh."). There are six episodes in all and they're all funny. It doesn't hurt that they're in Arizona too. Voyage Trekkers is a sci-fi comedy web series that follows a captain and his crew during the very worst moments of their space adventures. The episodes are the terrible events that would otherwise be deleted from the official records. "These are the voyages that don't make the captain's log." From Squishy Studios and Inside Creative Minds Media, the episodes are two to three minutes long in length, with ten weekly episodes starting on Monday July 18th, 2010. The videos will available through the Squishy Studios website and our YouTube channel. Watch the fourth episode "Voyage Trekkers - Episode 4: Language Barrier"
Check out the YouTube channel for the full list of episodes. What do you think of Voyage Trekkers and Star Trek parodies in general? I'll have to watch them. Thought Galaxy Quest was great. 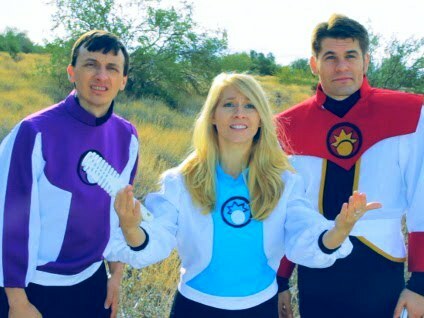 Alex, if you liked 'Galaxy Quest' you'll like these guys. Wonder if we'll ever see a sequel to that movie?